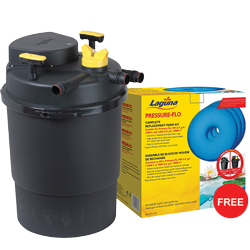 The new and improved Laguna Pressure-Flo pressurized pond filter eliminates green water and kills algae. The Laguna Pressure Flo provides mechanical filtration coupled with a powerful UVC sterilizer to produce a clear, clean and healthy pond environment for ponds. 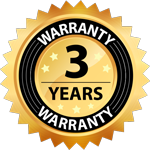 Includes universal Click-Fit Fast couplings for 3/4", 1" and 1 1/4" hosing connections.